The Metropolitan condominium community in Jacksonville Beach, Florida. 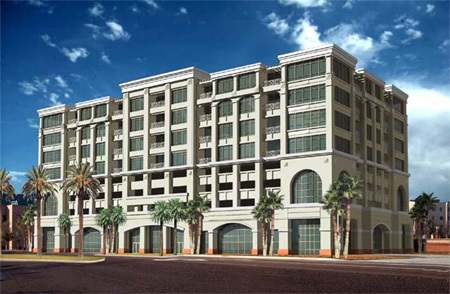 The Metropolitan is a luxury oceanside condominium in Jacksonville Beach. Built by Elkin Constructors, the building offers a concept combining luxury beachside residences with the convenience of on-site professional offices, shops and fine dining. The Metropolitan offers 34 residences, 18 office condos, retail shops, restaurants, pool, elevator and enclosed parking. All condos provide beautiful panoramic views of ocean shorelines and city, 12 foot ceilings, floor-to-ceiling glass exterior wall, two deeded parking spaces with additional reserved parking per condo. Amenities include elegant lobby with security personnel, two service elevators, secured garage parking, garbage chute on each floor. The Metropolitan is conveniently located in the heart of Jacksonville Beach. If you're in the mood for shopping, dining, dancing or just relaxing on the beach, all you have to do is walk across the street to the beach, amphitheatre, great restaurants, new oceanfront park and more. Other nearby points of interest include downtown Jacksonville's business and arts district, Ponte Vedra Beach, Amelia Island and historic St. Augustine.